We're still in a holding pattern on the much-discussed trade that would send Carmelo Anthony to the Nets, which means it is as good a time as any to sift through some of the many, many questions raised by the proposed deal. Who is going where in the deal? As of right now, the deal would send Anthony, Chauncey Billups, Anthony Carter and Shelden Williams from Denver to New Jersey in exchange for Devin Harris, Derrick Favors, Anthony Morrow Ben Uzoh, Quinton Ross and Stephen Graham. Detroit would ship Rip Hamilton to the Nets and get Troy Murphy and Johan Petro. The Nets would also send some quantity of first round picks to the Nuggets and maybe one to the Pistons as well. There are two. The big one is Anthony signing an extension with the Nets, something that would have to happen for the deal to take place. The other is the Nuggets' desire to add former Knicks Renaldo Balkman and Al Harrington, who has a ludicrous four-year deal, to the pot. It is easy to understand why the Nets would balk at taking back those two players, but only to a point. If they are already willing to mortgage their entire future to get Anthony and two players on the wrong side of the hill, why would Harrington get in the way? Why would Anthony sign an extension with the Nets? This is the biggest head-scratcher of them all. Even if you accept the very sensible approach that Anthony is taking about signing a new deal before this summer's labor negotiations change the playing field, signing up for the Nets team that will be created by this deal makes no sense. They'd be a little better than they are without Billups and Hamilton, but they'd be excessively thin up front and they have tons of ground to make up on the playoff contenders in the East. They could get better in the years to come, but it is difficult to see just how that happens. Billups's presence wouldn't make the team appealing to good point guards and they'll have gutted their entire ability to swing trades by making this one. That means Anthony would be going from a good team in a Western Conference that looks weaker than it has in years to a mediocre one in the rising Eastern Conference. Explaining that is difficult if you don't buy into the scenario pushed by Chris Sheridan of ESPN that his agents are pushing him to get a deal done before the lockout because they want to get paid under the current rules. Mr. Big Shot is a Denver native and wants to finish his career with the Nuggets. He's made it clear that he has no interest in playing in New Jersey and would request a buyout if he's included in the deal. He has no shot of getting one as he's got no leverage, but it's always a strange choice to willingly acquire a player who doesn't want anything to do with being on your team. Assuming Anthony is making Billups's acquisition a must for his own extension, that could mean the Nets have to extend Billups as well. That's a bad idea for a team looking to contend over the long term. Doesn't this sound like something Isiah Thomas would cook up? Absolutely. Anthony is better than anyone Thomas brought to the Garden, but this whole thing reeks of the short term pop with little sense that there's an actual team-building plan at work for the Nets. 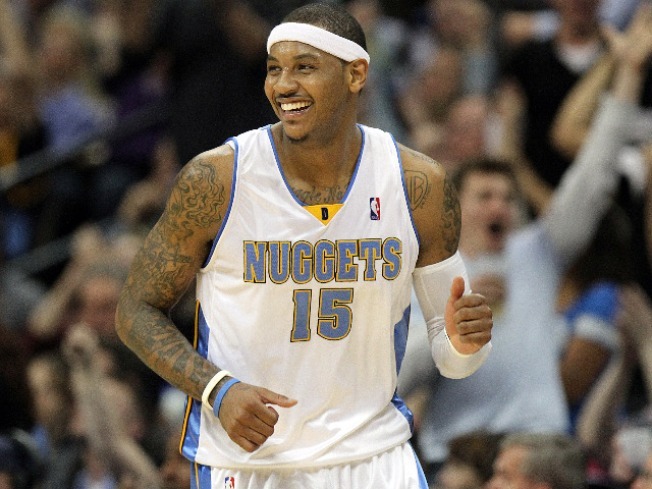 Is this really the best package the Nuggets could get? All depends on what you're looking for in a deal. If you want to actually be a decent basketball team, it is hard to see why they'd prefer this deal to one that sent Anthony to the Knicks for some combination of Wilson Chandler, Landry Fields and Danilo Gallinari. Throw in Eddy Curry's expiring deal for some future spending room and you've got a team that can keep on competing for the playoffs without missing a beat. The Nets deal is all about the future, both in terms of players and cap space. Pick your poison. Does missing out on Anthony kill the Knicks? It would certainly hurt, but what's not a part of the previous paragraph is whether the Knicks would actually make the trade we threw out there as a better package for the Nuggets. It's clearly in their best interests to wait for the end of the season when they can sign Anthony as a free agent. It's in Anthony's best interests as well as he'd be joining a winning team that would become deep enough to deal Chandler or Gallinari for the big man that the team so desperately needs. If Anthony doesn't come to the Garden, it's a loss but the team would still be better than the Nets and they'd still be in position to keep getting better. So, will the deal happen? It feels like it will, but anything with this many moving parts could very easily come apart before coming to fruition.